Precious Pages by Paula: MORE SWAPPING! This year I have been participating in several swaps, some of which I shared in my last post. I want to share with you the fun items I received in return as well as some others! For the Mythical Creature swap I had sent the Fairy Queen (shown in my previous post) and in return I received Venus! This was the fabulous tag. and this was inserted (see top of tag) and included some information about my partners family. It was very special! This holder was amazing and she also included a batch of diecuts and goodies! Here is the ATC out of the envelope. The attention to detail is incredible. I always struggle working small - I am much more suited to 12x12 layouts but I am working hard at this size by playing in ATC and Pocket Letters. which I chose to rotate 1/4 turn clockwise. 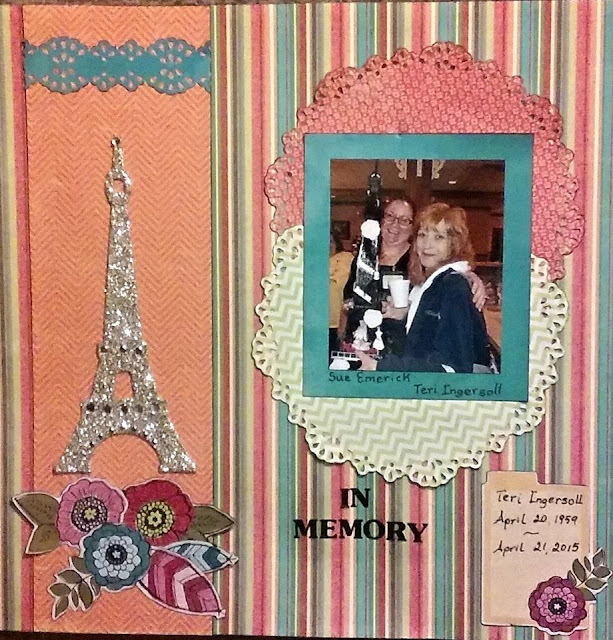 This layout was In Memory of a very special lady, Teri Ingersoll. I met her last year at Robins Scrap Nest Bee Happy Bee Scrappy Crop at the Carlisle Inn. A few days after returning home Teri passed away suddenly the day after her 56th birthday. She had long term health issues all her life but it is still way too young to pass. (Last year was a hard year for young people - I lost several friends and family members in their 50's.) She was so sweet. Here she is holding an Eiffel Tower made for her by Cassondra Gloden of Infinity Engraving. Next I am sharing a Pocket Letter I created about my current state - Delaware for a swap of all the states. It will go postal tomorrow and in return I will receive one from Kentucky! I also did a few tags...here is one for an 'All About Me' challenge at Paper Doll Trading. And this was done 'just because' so that I could use the fun Cheery Lynn die that I had just received! Word Art Wednesday in challenge #218. I think this about covers the bulk of my recent artistic ventures. Hopefully there will be more again soon. Sorry this took so long since my last post! Thanks so much for stopping by. Please leave a comment to let me know what you thought and that you were here!